Takeda is a long time Juarez regular, most notable in the late 90s and early 00s. Takeda first came to Mexico City to join the UWA in 1990, returning in 1992 and 1994 thru the last days of UWA. UWA initially hoped he could be their version of Octagon, a martial arts tecnico the fans would like, but turned out be a disappointment and his first push disappeared. He was brought back in slightly bigger roles in his later runs, as the talent started to disappear from UWA. Later, he had short stints in AAA and IWRG in 2007. Takeda's myspace page claims he's held championships which are not listed above and are generally ignored. It's only a small part of his career, but is a reoccurring on this page. He lists the NWA World Light Heavyweight Championship, explaining he won the a match for the title against El Dandy but was never given the belt due to a problem with the commission. 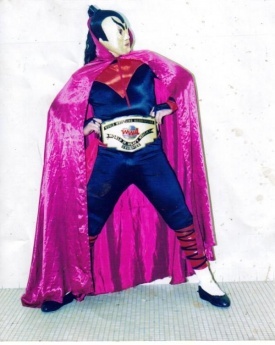 El Dandy was champion in 1995 and 1996, but there's no record of a title change, and it's be unlike CMLL at that time to have a unaffiliated luchador to win one of their championships. It's very likely there was a championship match between the two and Takeda was given some visual win in what ended up being a disputed finish. It is unlikely, but possible, that Takeda got the win with the promotion and Dandy agreeing it'd be ignored outside of Juarez. Takeda also claims having won the Mexican National Atomicos Championship with Maravilloso, Enigma and Samuary, which he then lost to Los Vatos Locos and Los Vipers in a cage match for AAA TV taping. That cage match does appear to have taken place on the March 21, 1999 in Chihuahua. However, detailed histories of this championship have been published, and there is no record of Takeda's team defeating Vatos Locos for this championship, as claimed. Vatos Locos are recorded as defending the titles as recently as two weeks before that cage match, which would leave only a little time for a title match. Takeda's team being included in the match suggests they were involved with the titles during that period at that time (none of them were AAA regulars), but there's no record of them being champion.